Dr. Samar Safi-Harb is a Professor in the Department of Physics and Astronomy at the University of Manitoba. 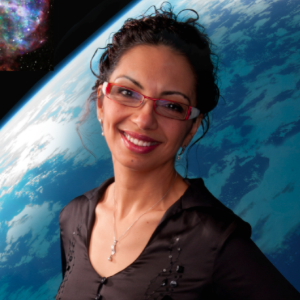 She is an astrophysicist whose research focuses on understanding the aftermath of supernova explosions and probing the most extreme, exotic and energetic phenomena in the Universe. Dr. Safi-Harb received her undergraduate degree in Physics at the American University of Beirut and pursued her graduate education at the University of Wisconsin-Madison. She subsequently held a National Reasearch Council Fellowship at NASA’s Goddard Space Flight Centre in Maryland, before moving to the University of Manitoba, as NSERC University Faculty Award fellow – followed by a Canada Research Chair position – to lead to the development and establishment of a new astrophysics program. She serves on several national and international committees and is active at promoting science and Physics & Astronomy, especially among women and minorities. Most recently, she received the 2017 WXN Top 100 Canada’s Most Powerful Women (Trailblazers and Trendsetters Category) award. As a passionate active researcher, an inspiring popular teacher, an active player in community service, and a mother of two young children, Dr. Safi-Harb provides a role model for women who wish to pursue their career in Science, especially those who strive to follow their passion and overcome obstacles to fulfill their dreams.